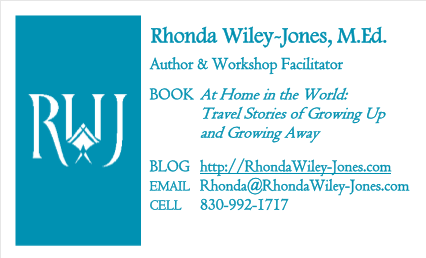 My coming-of-age, travel memoir, At Home in the World: Travel Stories of Growing Up and Growing Away, is on sale. For black Friday and through the holiday season, I have reduced the price for the paperback from $16.99 to $9.99. During the gift-buying season, I have reduced the price of the Kindle version from $4.99 to $2.99. Pick up a signed copy for yourself or a friend for $10. You can find me at Kerrville Market Days, December 3, 2016, at the Ag Barn on the Kerr County Fairgrounds. I’ll be signing and selling them from 8:00 a.m. to 3:00 p.m. I hope to see you there. Although the story is about a young woman’s travels alone and with others, some of my biggest fans have been men from my high school graduating class. So don’t forget to buy it for the men in your life as well. Thanks for buying my book. I sure hope you or your loved one enjoys reading it.